A remarkable new species of tyrannosaur has been unearthed in Grand Staircase-Escalante National Monument (GSENM), southern Utah. The huge carnivore inhabited Laramidia, a landmass formed on the western coast of a shallow sea that flooded the central region of North America, isolating western and eastern portions of the continent for millions of years during the Late Cretaceous Period, between 95-70 million years ago. The newly discovered dinosaur, belonging to the same evolutionary branch as the famous Tyrannosaurus rex, was announced November 6th, 2013 in the open-access scientific journal PLoS ONE and unveiled on exhibit in the Past Worlds Gallery. Among tyrannosaurs, a group of small to large-bodied, bipedal carnivorous dinosaurs including T. rex that lived during the Jurassic and Cretaceous periods, the newly discovered species, Lythronax argestes, possesses several unique features, a short narrow snout with a wide back of the skull with forward-oriented eyes. The study, funded in large part by the Bureau of Land Management and the National Science Foundation, was led by Dr. Mark Loewen, research associate at the Natural History Museum of Utah, and adjunct assistant professor in the Department of Geology and Geophysics at the University of Utah. 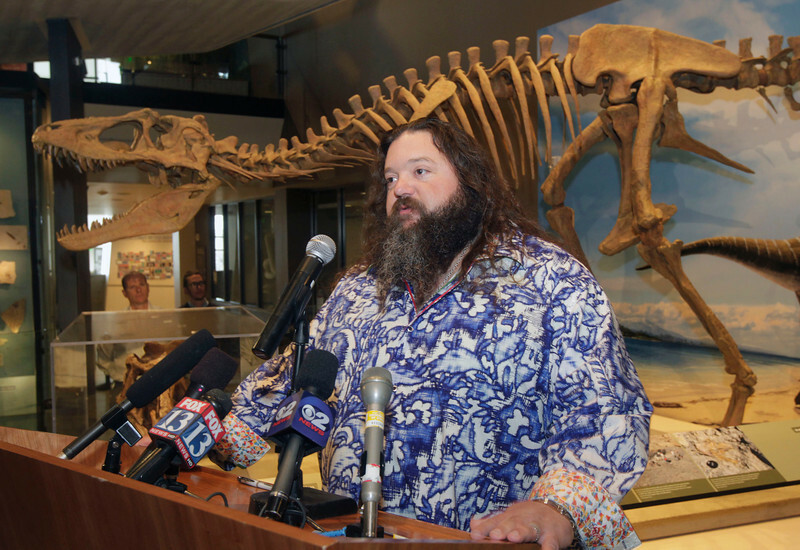 Additional collaborative authors include Dr. Randall Irmis (Natural History Museum of Utah and Dept. of Geology and Geophysics, University of Utah), Dr. Joseph Sertich (Denver Museum of Nature & Science), Dr. Philip Currie (University of Alberta), and Dr. Scott Sampson (Denver Museum of Nature & Science). The skeleton was discovered by BLM employee Scott Richardson, and excavated by a joint Museum-GSENM team. Name: The first part of the name, Lythronax, (LYE-thro-nax) can be translated as the “king of gore” or “gore king” in reference to its large teeth and carnivorous lifestyle. The second part of the name argestes (ar-GES-tees) comes from the poet Homer’s southwest wind, in reference to the southwestern geographic location of the specimen. Size: Lythronax was approximately 24 feet (8 meters) long and weighed around 2.5 tonnes. Relationships: Lythronax belongs to a group of carnivorous dinosaurs called “tyrannosaurids,” the same group as the famous Tyrannosaurus rex. Anatomy: Lythronax was a two legged carnivore, the largest carnivore in its ecosystem. Age and Geography: Lythronax lived during the Campanian stage of the Late Cretaceous period, which spanned from approximately 84 million to 70 million years ago. This animal lived about 80 million years ago. 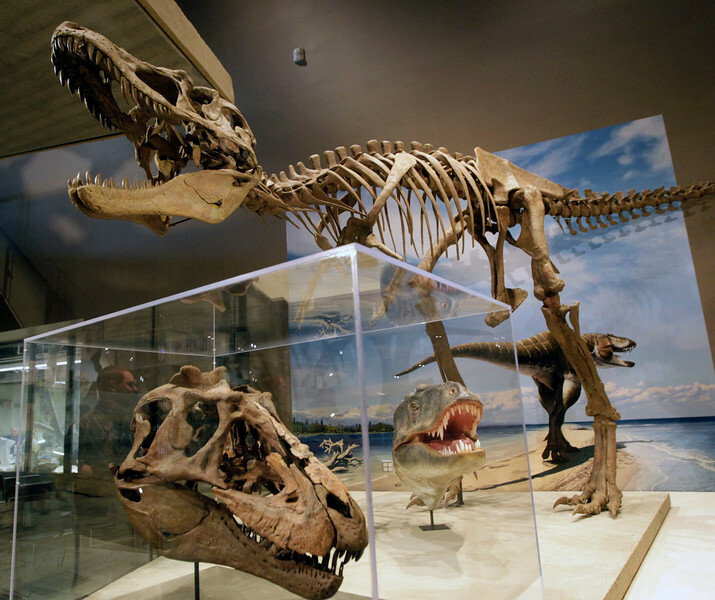 Discovery: Lythronax was first discovered by BLM employee Scott Richardson in 2009. Scott also found the first specimen of Kosmoceratops, a bizarre horned dinosaur from GSENM. Excavation: Other fossils found along with Lythronax at the site include parts of turtle shell, crab claws, leaf impressions, and a few molluscs. The bizarre horned dinosaur Diabloceratops eatoni was recovered from nearby rocks of the same age. 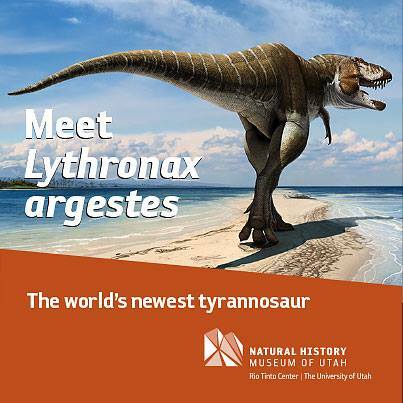 You can find more information, fast facts, videos and photos on the Lythronax argestes discovery on the NHMU Newsdesk. Visit the Past Worlds page for more information on our exhibit.